Kementerian Badan Usaha Milik Negara – Kementerian BUMN is a Ministry Indonesian government in charge of the affairs of state-owned enterprises ( BUMN ) . SOE Ministry is headed by a Minister of State Owned Enterprises ( Kementerian BUMN ) that since October 19, 2011 held by Dahlan Iskan . 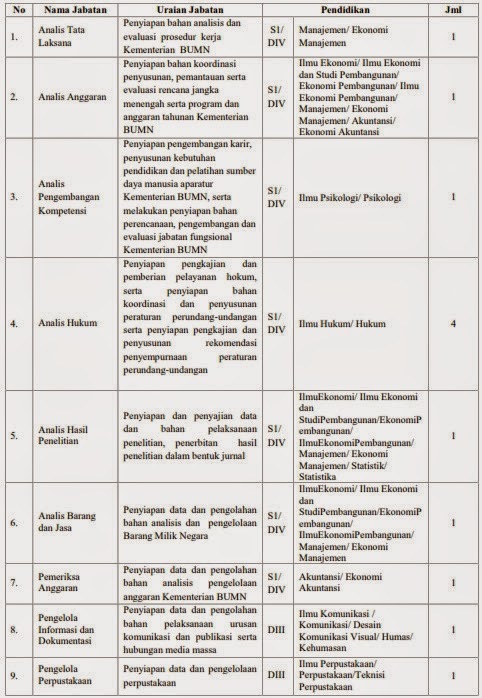 Placement of all employess on these positions is at the Office of Ministry of Enterprise, Central Jakarta. Well-behaved and never sentenced to prison or jail based on court decisions that have had a permanent legal force, because doing a criminal act. There was never dismissed with respect not his own request or not with respect as CPNS / PNS, TNI / police, officials state / local enterprises or private employees. Not located as a candidate for Civil Servants or the Civil Service. Not be involved in and / or members of a political party. Drug free, no tattoos and no bertindik (except for women with one stud in each ear). Between the ages of 18 (eighteen) years and 28 (twenty eight) years of age on October 1, 2014. At the register, the applicant has to have a law degree (S1), Diploma Four (DIV), or Diploma (DIII) of the State Universities (PTN) / Private Colleges (PTS) with a minimum B field of study accredited by the National Accreditation Board for Education (BAN-PT) and Foreign universities that have received outside the State Equalization diploma from the Ministry of Education and Culture. Applicants with diploma qualification S2 can apply for positions at S1 by using S1 diploma / DIV her, and applicants with a diploma S1 / DIV can apply on DIII qualifying position using DIII his diploma, provided the applicant was appointed as civil servants after the Ministry of Enterprise, diploma S2 (for applicants who have a diploma qualification S2 on S1 / DIV) and diploma S1 / DIV (for applicants who have a diploma S1 / DIV on qualifying D3) will not be recognized in the process of staffing at the Ministry of Enterprise. Have a grade point average (GPA) of at least 3.00 to 3.25 and the State Universities to Private Universities (scale 4). For university graduates (PT) from abroad are required to make up the numbers GPA conversion scale to 4 under the rules of the Directorate of Higher Education (Higher Education) when not using the scale 4. Having English proficiency with a TOEFL certificate from the Institute of Languages ? ?State University or Language Unit State University or educational institution accredited English with a minimum value of 450 or TOEFL-IBT (Internet-Based TOEFL), published by The Indonesian International Education Foundation (IIEF) with a minimum value of 53 or IELTS published by the Education Foundation of Australia (IDP) with a minimum value for the prediction test scores 5. declared invalid. TOEFL / IELTS certificate is still valid until October 1, 2014. When charging is sure to fill out the form with correct and complete registration stuffing as directed. Error filling so that there is a discrepancy with the application file selection process resulted in failing administration. Print Card / Registration Receipt CPNS 2014. Card / Registration Receipt CPNS 2014. The format of the statement can be found in the appendix of this announcement. A waiver must be signed on A4 size paper with a stamp affixed. Whilst the diploma is not valid. A notarized certificate of accreditation or B for majors / programs of study in graduation and still valid legalized universities concerned. Copy of certificate of TOEFL / IELTS is still valid until October 1, 2014. Recent color photograph size 4×6 3 (three) pieces. Write the applicant’s name and registration number on the back of the photograph. Pinch all documents with a staple gun and insert the blue paper folder who has written code in the front office, then the application folder included in the brown envelope and write on the top left corner of the proposed position code. For applicants who choose more than 1 (one) position, write code proposed position based on the priority choices. Applicants who passed the administrative selection will then be followed with a TKD Participant Card Exam (KPU). KPU pelamarmelalui email will be sent to applicants who used at the time of registration. Applicants do KPU printing and attaching recent photograph with the same 4×6 size photograph submitted with the application file. Location and schedule execution with system test TKD Computer Assisted Test (CAT) will be announced at the time of the announcement of the administration in the website www.bumn.go.id the third week of September 2014. Teams are not allowed to charge in the selection of CPNS Ministry of Enterprise. The team is not responsible for any fees or offer form by elements on behalf of the Ministry of Enterprise. Team decision in terms of graduation applicants at each stage of the test is absolute and can not be diganggugugat. For those who never filed an application to the Ministry of SOEs throughout this announcement are qualified in, in order to file a return in accordance with procedures applicable (the application has been sent to the Ministry of Enterprise deemed not applicable). Application file that has been entered into teams belong to the Ministry of SOEs. The announcement every stage of the test results displayed online and can be viewed on the website www.bumn.go.id. Team debriefing does not serve in any way associated with the application. If applicants provide information / data that is not true and in the future is known, either at each stage of the test and after the appointed CPNS / PNS in the Ministry of Enterprise, Ministry of Enterprise reserves the right to abort the graduation and / or dismiss as CPNS / PNS in the Ministry of State-Owned Enterprises , and / or demand compensation for damages caused by the State yangterjadi incorrect information and / or to report a crime to the authorities for giving false information. Copyright © All right reserved. | Theme: Newslite by eVisionThemes - 85 q. 1.646 s.